Text Cannot be Special Summoned, except by the effect of a Wyrm-Type monster. 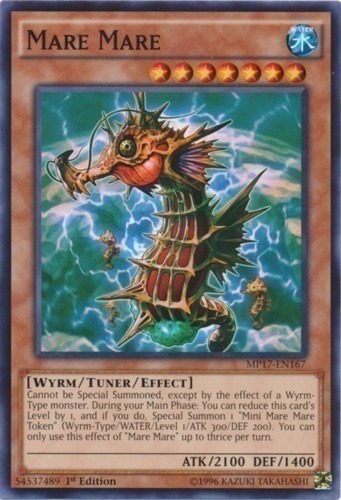 During your Main Phase: You can reduce this card's Level by 1, and if you do, Special Summon 1 "Mini Mare Mare Token" (Wyrm-Type/WATER/Level 1/ATK 300/DEF 200). You can only use this effect of "Mare Mare" up to thrice per turn.